KRITZMAN, George (b. June 21, 1923) in Avella, PA, 35 miles southwest of Pittsburgh. George graduated high school in the Summer of 1941 after which he joined the U.S. Merchant Marine Academy at Kings Point, N.Y. as an engine cadet. In the Fall of 1942 he made the run to Murmansk and Archangel, Russia aboard the liberty ship John Walker. Seven ships out of a convoy of 13 were sunk. He returned to the U.S. in February 1943 and was reassigned from the USMMA due to chronic sea sickness. Kritzman was drafted into the Army in March 1943, and assigned to the 4th Amphibian Engr. Bde., 594th Regt., Co. C as a marine engineer. Later in the year he was transferred to the 337th Harbor Craft Co. After various duties in the war, he joined the Los Angeles Police Department in 1947. 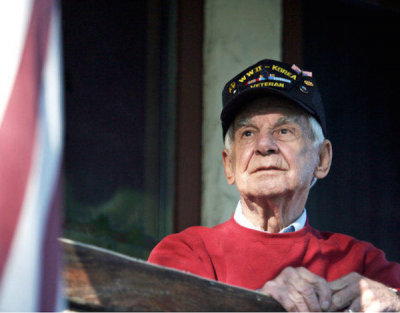 In 1950 Kritzman was recalled for service in the Korean War, where he was wounded in the shoulder by machine gun fire. After his recovery, he was wounded a second time in his right femur. He was featured in the Warner Bros. documentary, One Who Came Back, nominated for an Academy Award in 1951. He returned to the Los Angeles Police Force as an LAPD liaison officer in 1952 before officially retiring in 1978. Kritzman attended the University of Southern California and graduated in 1959 with a degree in archaeology. In the 1960s and 1970s, he worked on various California Channel Islands, including as an archaeological field assistant to Charles Rozaire on Daisy Cave, San Miguel Island. Kritzman was also Curator of Archaeology at the Southwestern Museum in Los Angeles until 1981-2005. George Kritzman and his wife, Mildred, married in 1972. They had no children together, but his stepson, orthodontist Dr. Bart Conroy, has two daughters, Macall (Vassar) and Mairin (Boston University). George Kritzman became member #40 of the All Eight Club in 1996. This page was last edited on 4 April 2017, at 11:53.